Video Production and Live Webcasting company based in Edmonton and Calgary. As with any new logo design the process includes the exploration of many different ideas. We presented a shortlist of these to the client along with a rationale for each. The frontrunner and eventual winner was based around the mascot for the society – a Canadian Goose. ‘Niska’ is a Cree Indian word meaning “Canada Goose” and is the name of the ‘Safe and Caring’ mascot. We thought that bringing this into the logo would help with the overall branding. The lifestyle of the Canada Goose reflects the values of ‘Safe and Caring’, they live in flocks to support one another and take care of their young. 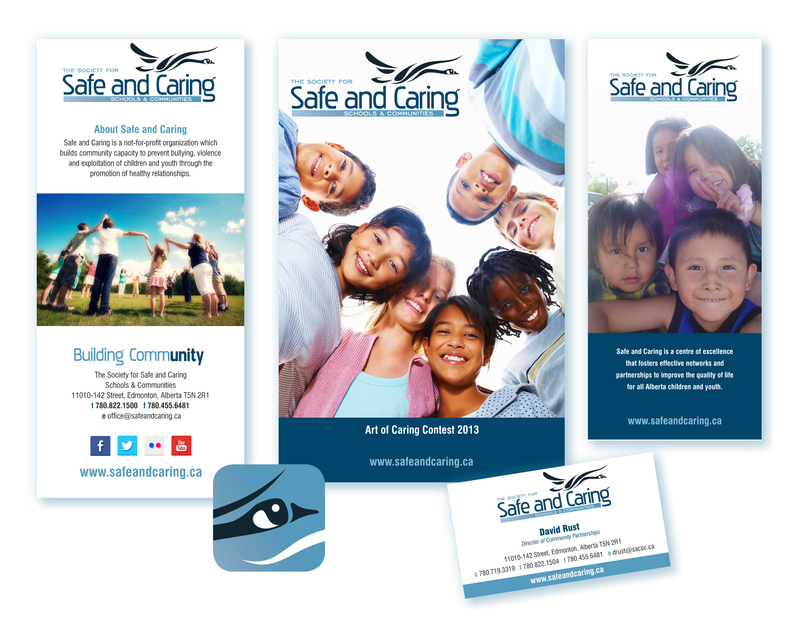 ‘Safe and Caring’ believes that youth are the responsibility of every adult in the community. We adapted the logo for use on all their social media channels, created brochures, marketing materials and displays.